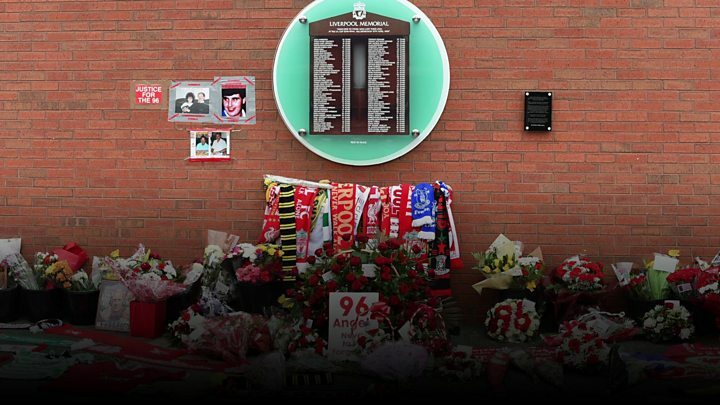 Families of the 96 victims of the Hillsborough tragedy have arrived in Warrington to hear the inquest jury's conclusions on how and why they died. After hearing more than two years of evidence, the jury of six women and three men began its deliberations on 6 April and finished on Monday. 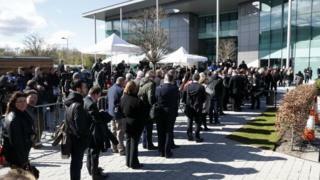 The forewoman said at least seven of them had reached agreement on whether the 96 had been unlawfully killed. Their conclusions will be delivered at 11:00 BST in Warrington, Cheshire. The jurors, who have spent nine full days considering a 14-section questionnaire, reached unanimous conclusions on 13 of the questions. The remaining section - for which they were told they could return a majority decision - asks whether the 96 were unlawfully killed. To answer yes, jurors must be "sure" that match commander Ch Supt David Duckenfield was "responsible for the manslaughter by gross negligence" of those who were fatally injured at the FA Cup semi-final between Liverpool and Nottingham Forest in Sheffield on 15 April 1989. Jurors have also decided whether fans' behaviour added to a dangerous situation outside Sheffield Wednesday's stadium. They have also made conclusions about whether police "errors or omissions" caused or contributed to the dangerous situation at the match and the crush on the terraces. Based on the evidence, the jury have also decided whether police and ambulance service responses to the crushing "contributed to the loss of lives". Coroner Sir John Goldring began his summing up on 25 January and spoke to the jury for 26 days in total. The hearings are the longest running inquests in British legal history. Finally, the jury must be sure the breach which caused the deaths amounted to "gross negligence"
For the final point to be proved, the jury has to be sure the match commander's breach in his duty of care was so bad it amounted to a criminal act or omission. It must also be sure a "reasonably competent and careful" match commander in his position would have foreseen a "serious and obvious risk of death" to the supporters.